This was taken in the garden of the Kagyu Samye Ling. This Tibetan Buddhist Monastery, the first in the West, was opened in 1967 in the Scottish Borders. Find out more about it here. Any foreigner who has visited Scotland will have been regaled with tales of the Loch Ness monster, the kelpies and the haggis, supposedly a ‘wee beastie’ with two short legs and two long legs to aid it in walking on mountains. Here’s a fun video about the haggis. The Lonely Planet Guides are considered to be the ‘go to’ books for travellers around the world. Not the people who book a package deal, all inclusive, drinks by the pool kind of holiday but people who genuinely want to go somewhere to see beautiful scenery and enjoy the local culture. For 2014, the Lonely Planet team have suggested Brazil as the number one choice for ‘Best in Travel’…football anyone? Number two is Antartica…who wouldn’t love to go there! In fact, I know a lady who went there when she was in her late seventies and has the photos to prove it. Quite a gal, I can tell you! 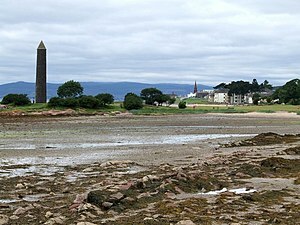 And in the number three slot, why it’s Bonnie Scotland, where I am currently lucky enough to be living. Glasgow is hosting the 2014 Commonwealth games and already the city is gearing up for a big party. Further afield, the Ryder cup golf competition is coming home to Gleneagles and of course, Edinburgh is the place to be in August for the Festival or for the Hogmanay celebrations in winter. Scotland may not have the best weather. Somehow though the rain is almost part of its charm. 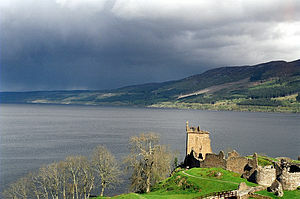 Nobody could be fooled into believing in the Loch Ness monster on a bright, sunny day; stand at Castle Urquhart on a misty day and gaze out over the loch and you’ll be seeing humps and heads everywhere. Scotland’s scenery is genuinely breathtaking, from the banks of Loch Lomond to the ancient forests of the Cairngorms National Park, from the grand castles to the Great Glen and on out to the beautiful islands. 2014 will also be Scotland’s “Year of the Homecoming” with events throughout the year to celebrate the great events and culture of this wee nation. It will be the 700th anniversary of the Battle of Bannockburn, the iconic Forth Road Bridge celebrates its 50th anniversary not to mention all the usual festivals such as the Highland Games, the Edinburgh Tattoo and the Wickerman Festival. You can climb Munros (Scottish mountains over three thousand feet) or taste the ‘water of life’ otherwise known as Whisky, try the traditional dish of haggis, neeps and tatties and listen to bagpipe bands. Interestingly, Scotland isn’t the only country where you can hear bagpipes played but there is something very special about hearing the skirl of the pipes outside Edinburgh or Stirling Castles. The Queen is woken every morning of her summer holidays at Balmoral by a bagpiper outside her window. I love Scotland and I’m sure you will too if you come on a visit in 2014. You can be assured of a great welcome. 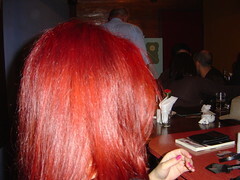 Thanks to their Viking heritage, many Scots have red hair. However, they suffer all kinds of abuse, especially when young, being labelled ‘gingers’ and worse. Now a Canadian man has used the Edinburgh Fringe Festival to stage a ‘Ginger Pride’ rally. Click on the link to find out more in an article written by Anne Sewell for Digital Journal. The Scottish Wildcat Association say that evidence collected suggest that there are only around 100 animals in the wild and that total extinction may occur as soon as this year, 2013, if urgent measures to protect the wildcat are not put in place. The Scottish wildcat used to roam across Britain in ancient times but the advance of civilisation forced them to move into the Highlands of Scotland. Scottish clans took the image of the wildcat as their talisman during battles and the animal is an intrinsic part of Scottish heritage. Far from being cuddly kitties, the Scottish wildcats have a fearsome reputation with stories told of them evading shepherds to steal lambs and even a tale of a mother cat taking on a Golden Eagle to defend her kittens. The animal looks like a large tabby cat but with more muscle and well defined black and brown stripes. Males can weigh up to 9 kilograms and females up to 7 kilograms. Fossilised examples have been found that measure four feet from nose to tail and that would have weighed around fourteen kilograms. They are mainly nocturnal, hunting at dusk and dawn and are solitary animals. 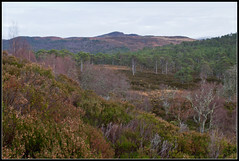 The Cairngorms National Park has been identified as a stronghold for the wildcats and is the centre of conservation projects.Will Boyd-Wallis of the Cairngorms National Park Authority said that one of the strengths of the Cairngorms Wildcat project was the combination of voluntary effort by land managers, gamekeepers and by Cats Protection alongside rigorous camera trap research. “We are determined to assist the action group in encouraging this to continue in the Cairngorms National Park and elsewhere”. 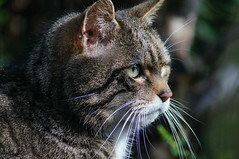 Experts from various organisations such as Scottish Natural Heritage and the Royal Zoological Society of Scotland, amongst others, are working together to try and save the Scottish Wildcat. Their main enemies are unfortunately humans, with gamekeepers killing the cats to keep them away from shooting grounds in the Highlands. Interbreeding with domestic cats is also leading to the decline in the species. A national campaign has been launched to protect the species and to raise awareness. If this last ditch effort fails, another rare animal will pass onto the list of extinct species. An article by fellow writer, Robert Myles, about a conservation week being run by the Trees for Life conservation charity from 25 May to 1 June 2013 where participants can find out more about the rare bird life in the Scottish Highlands. 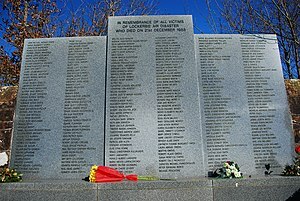 This year sees the twenty fifth anniversary of the Lockerbie bombing, where 270 people were killed when Pan AM Flight 103 from London to New York exploded over the small town of Lockerbie in Scotland.